If there was one crochet book I had been hankering after it was Edwards Menagerie by Kerry Lord. The loved the adorable designs, the natural colour scheme and the general aesthetic of the book. As often happens time passed, I got bogged down in my full time job and crochet (and blogging) very much fell by the wayside. In recent weeks however I have felt that I have really got my act together.....I published a new design, got cracking with my Christmas crochet (sorry about the mention of the 'C' word, although to a crocheter being only 3 1/2 months away feels like its a terrifyingly near prospect!) so when an email pinged up in my inbox asking me to review Kerry's new crochet book, 'Edward's Menagerie: Birds' there was no way I could decline! There is so much more to this book than your bog standard crochet toy book. Delving further: Kerry writes a brilliant preface to her book explaining the story behind the menagerie. I loved to read about how the menagerie are inspired by and made for her young son Edward. Delving even further I discovered the back story to this book, and it is a truly inspiring tale of entrepreneurship, a family run business giving opportunities to aspiring designer makers and crocheters, self-sufficiency, alpaca farming and stunning yarns. I really urge you to take the time to visit the Toft website and peruse their gorgeous yarns and incredibly cute Alpacas (see their blog for this)! I will write more on this in another post as I also got to visit the farm and meet Kerry herself. For now I will just stick to a review of the book. Getting down to business- the patterns: There are over 40 birds to crochet in this book (if you buy direct from their website there are some bonus patterns included), which have all been given their own names and personalities (many of which are based on Toft employees who were heavily involved in the development of this book). As Kerry mentioned when I visited the Toft Farm this book is a slight step-up skill-wise from their first book, but still suitable for beginners. The book is separated into three levels, based on their difficulty. The most difficult patterns include more complex colour changes, but nothing that cannot be tackled with a bit of practice and perseverance. What is fantastic, especially if you wanted to crochet the whole menagerie (if only I had the time! ), is that all the birds are based on the same standard body form. 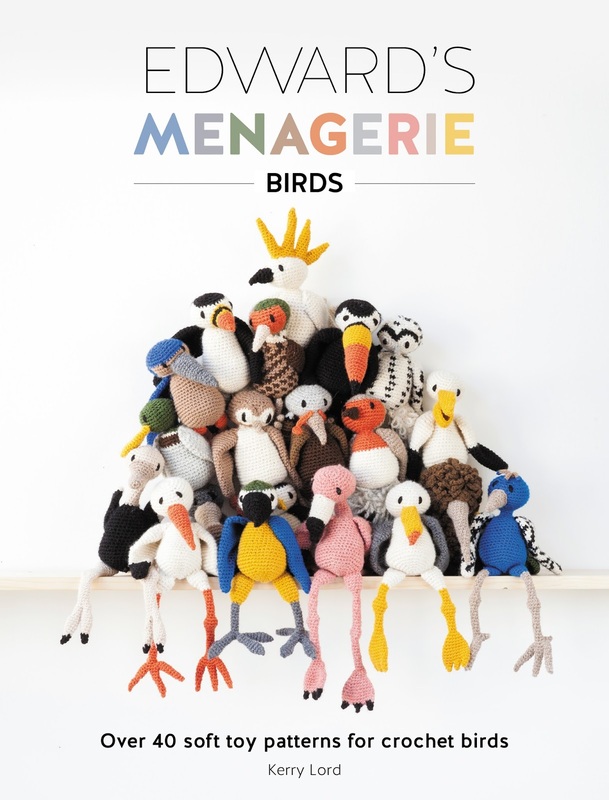 For one this means that you can quickly memorise the increases and decreases making for a quick and relatively easy project, and secondly that all the birds look great together as a collection. 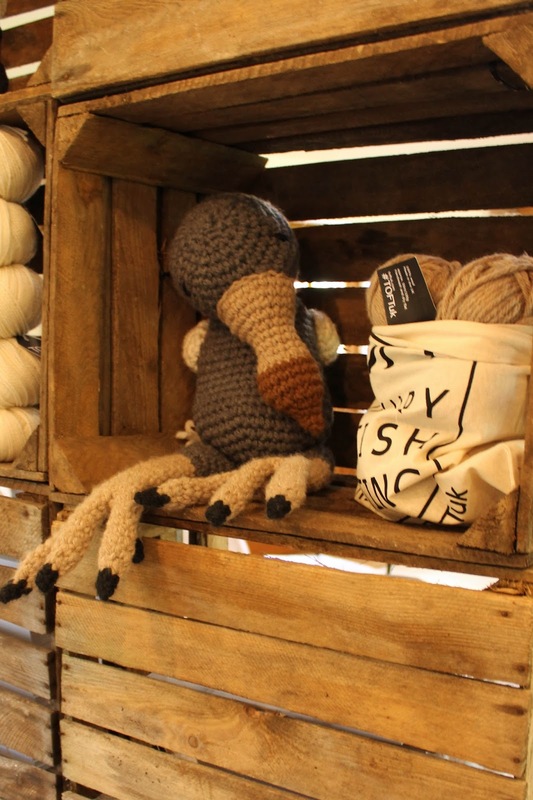 Another positive selling point is that the birds can be crocheted in a range of wool weights, making for a tiny intricate 4ply bird to a big chunky bird such as Elizabeth the Dodo pictured below. Most importantly when reviewing a crochet book is the clarity of the instructions, and whether the finished article resembles what it should or whether it ends up looking like a wonky creature not out of place on planet Zog (I know this from experience). 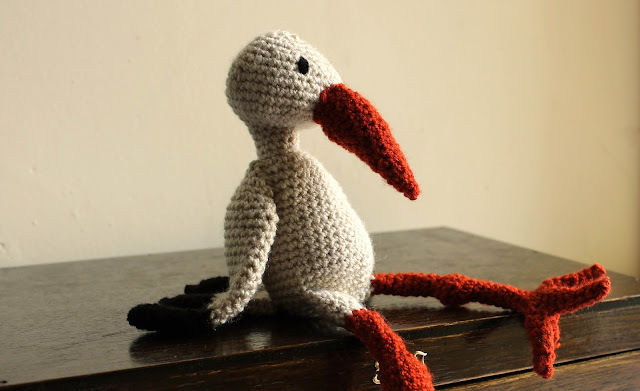 I have to say however that I had absolutely no problem crocheting up Ina the Stork. Ina is a level 1 bird, making her one of the simplest. This is no way whatsoever takes away from the final look of this bird. What do you think? I've become quite attached and she is sitting atop my sewing box next to me as I type! The only thing I would say, and which is why the birds are a step up from the first animal book, is that the legs and feet are pretty fiddly- lots of rounds with only a few stitches per round requires concentration and a bit of perseverance. A note on my version of Ina: sadly she was not crocheted in the gorgeous Toft Alpaca yarns the book was designed in. I just used what I had to hand, namely some double knit acrylic. I have now indulged in some of this yarn of squishy delectable loveliness so watch this space for some more of #edsanimals. Any yarn will work with this project though, and as they are small only use scraps for the colourwork section. Another note: I sewed poor Ina up in the half-light in a caravan after a good few beers- her poor legs are a bit wonky! Verdict on this book: If you haven't picked it up yet then do. You will not be disappointed and will quickly become addicted. This is a beautiful book with clear written patterns, and I can guarantee that if you have kids they will love these birds. Evidence for this comes from my day at the Toft farm where young children were coming in with arms of these birds their parents and grandparents had lovingly crocheted for them. Disclaimer: I was not paid in any way to review this book, I was invited to the farm for the book launch, but this event was publicised and open to all. All opinions are my own and 100% honest, I truly think it is great! Snap! love your detailed review, we wired Ethels legs for her portraits! it is a lovely book i agree!